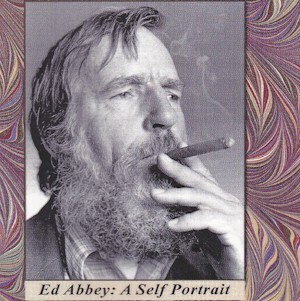 Description: "Edward Abbey: A Self Portrait" - Audio CD recorded at Edward Abbey's studio in Tucson, Arizona in January 1983 by Jack Loeffler. Produced in 2008 for "Confluence - A Celebration of Reading and Writing in Moab". Attendees received a copy of the CD, but there was no public release. For fans and aficionados of Edward Abbey, this audio CD is an indispensable source for previously unpublished quotes by the author. Tracks include: Ed's personal history and taste - The nightmare of modern history - Sabotage and terrorism - Faces of jeopardy - Human greed - About Indians - Stages of a man's life - Introduction to "The journey Home" - Final Chapter of "The Journey Home". This CD is shrink-wrapped, unopened and in new condition. Edward Abbey photo by Richard Byrd. Run time is 71 minutes 41 seconds.